↑ "Mean Climatological Data" (PDF). Meteorological Service (Jamaica). （原先內容 (PDF)喺2012年9月16號歸檔）. 喺15 October 2012搵到. 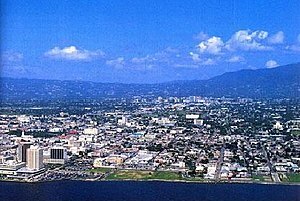 ↑ "Average Conditions Kingston, Jamaica". BBC Weather. June 2011. （原先內容喺2005年5月26號歸檔）. 喺18 December 2009搵到.